This time of year when we are all getting colds, I like to serve Chicken Noodle Soup pretty frequently. This is my go-to recipe when I use the slow cooker. It’s a simple recipe, but my tip is to take out the chicken after about 4 hours or it will get really tough. If you aren’t ready to serve the soup after 4 hours of cooking, store the shredded chicken in the refrigerator until it’s time to add the noodles (10 minutes before serving) and add it back to the slow cooker to reheat. You can continue cooking the broth for up to 8 hours. Add whole chicken breasts, carrots, onion, celery, thyme, rosemary, sage, salt, pepper, and bay leaf to the slow cooker. Add chicken broth to cover (add water if you need more liquid). Cook on low for 4-5 hours. Remove chicken and shred. Place chicken back into slow cooker and add in egg noodles. Cover and cook on high just until noodles are tender, 5-10 minutes. Add parsley and serve with crackers. 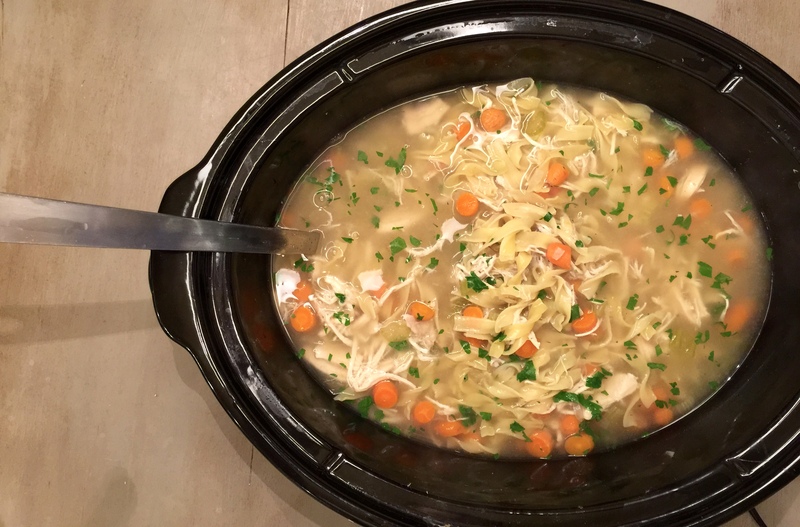 Copyright © 2016 Our Everyday Dinners - This is an easy recipe for how to make Slow Cooker Chicken Noodle Soup.